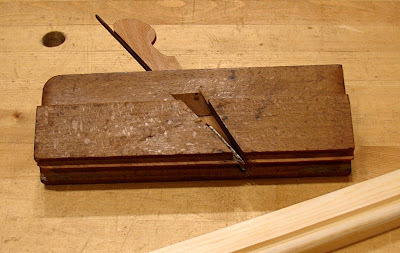 The other day I successfully replaced a broken wedge on a side bead moulding plane that I bought on eBay. This was an almost "perfect" project. 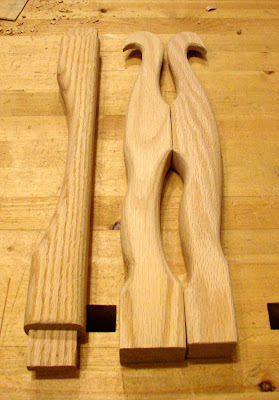 What made it special was a combination of many of the things I especially enjoy in a project: an old tool brought back to life, using shop-made equipment (successfully), finding a suitable job for a special stash of wood, applying my developing skills to overcome a lingering mental block, and a full and complete project in under two hours. That's a rare single project combination in my shop! I'd had this plane for a while, but had not been able to use it because the wedge that holds the iron had broken off the very first time I tried to remove it (and yes there is an embarrassing story there, and no, I'm not going to tell it now). 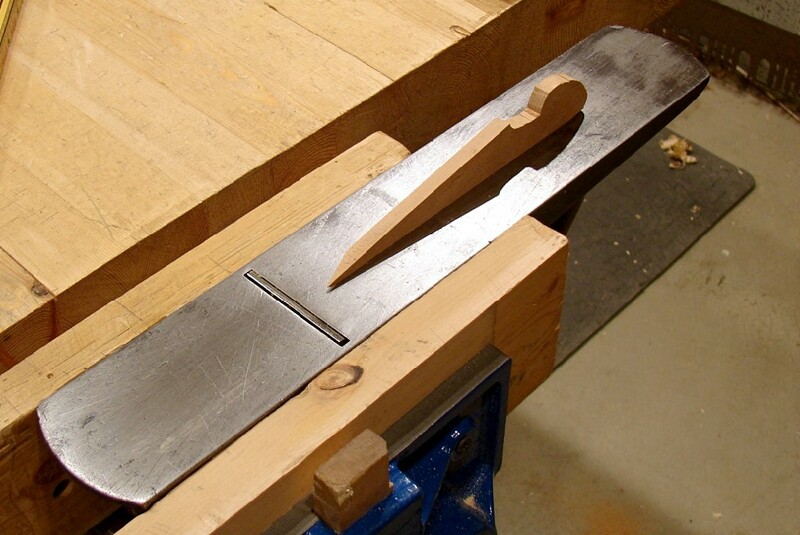 I successfully removed the remainder of the jammed wedge from the plane by turning it upside down, clamping the stump of the wedge in the bench vise and lifting the plane body off of it. But that is when the mental block came into play. For some reason I was intimidated by the idea of making a replacement wedge. I'm not sure why, but I convinced myself that this would be a hard thing to do. Stupid. And so this poor plane had been languishing on my desk; the island of misfit tools. The first step was to prepare some stock. I was going to use some oak, when I remembered that my good friend Dave had sent me some hunks of salvaged beech wood, which would be much more appropriate. Thanks again Dave! 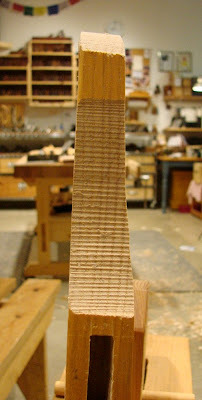 After cutting a piece and resawing it to approximate thickness, I planed it to final thickness by working against one of my bench dogs. This is a handy trick for thin stock. 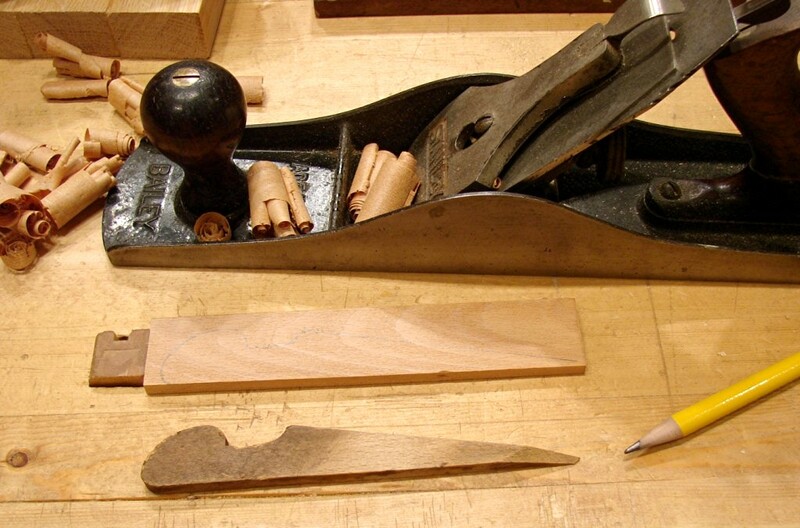 I also traced the outline of the original wedge (after piecing it back together) on the new blank. Taking it over to my saw bench, I used the slot in the overhanging end as a birdsmouth and cut out the shape of the wedge and finial with a coping saw. 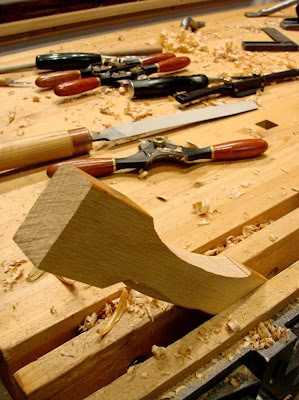 I cleaned up the finial curves with a file, and after some trial and error adjustments to the wedge angle, I had what looked and felt like a good fit. But there was only one way to be sure. A quick trip to the Scary Sharp bench, and the ca. 1850 Winsted plane was ready for a test drive on the sticking board; it worked great! Just wanted to mention that I've updated my List-O-Books link in the left sidebar. It's under the Woodworking Library heading. I also made the link font bigger (thanks Josh!). As always, my favorites are in bold. If you see anything you'd like more information about, feel free to post a comment here or email me. How to Make Mission Style Lamps and Shades - I've been eyeing this book for at least a year at a local used book store. As I think I am getting ready to try my hand at making a lamp, I thought this book might prove useful. The Craft of Chair Seat Weaving with Cane, Rush, Splint and Rope - These were more of a long range purchase. I'm sure at some point I will want to learn how to do this, but the books were available now. 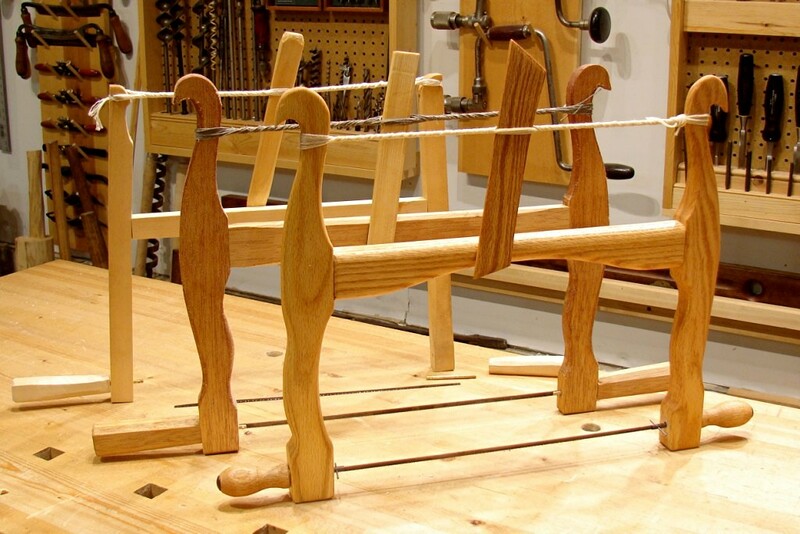 The Best of Fine Woodworking: Beds and Bedroom Furniture - Full of good ideas. Most of the techniques are power tool oriented, but I bought this more for the design information. Country Pine Furniture - This is a book written for the "collector" - I have a number of these in my library. The text of these books I find frequently strange, sometimes interesting, and occasionally flat out wrong (IMHO). They do however, tend to include nice photographs which I love to pore over. Williamsburg Reproductions - Now this one is really odd. It's a catalog from the early 1970's. It covers reproductions of everything: furniture, china, wallpaper, lamps, trivets, candles, silver, pewter, paint etc. While it does have some photographs of historical pieces (including a paneled chest which also appears in the Country Pine book above - synchronicity!) it is almost entirely devoted to listing and selling reproductions - but I still found it an interesting potential resource for ideas. There wasn't much left to do on the saw, but it still took me awhile. I snuck in one short work session during the week and one longer one today and the saw is done! Wahoo! 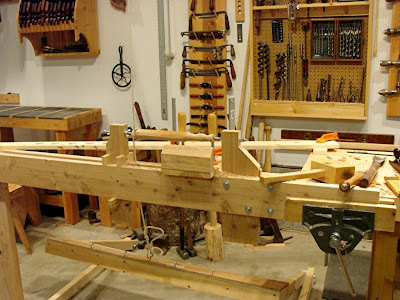 To mount the knobs and rods I had to bore holes through both arms near the bottom. First I had to rework the bottom section of the "handle" arm. 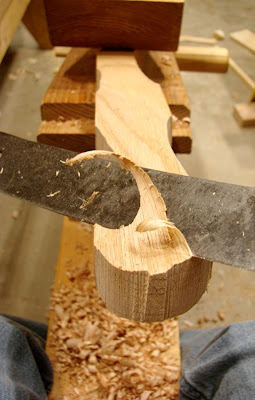 I had left it wider than the other arm, and while I am sure I had a reason, I couldn't remember why I had done that, and it didn't allow for enough of the rod to clear the arm. 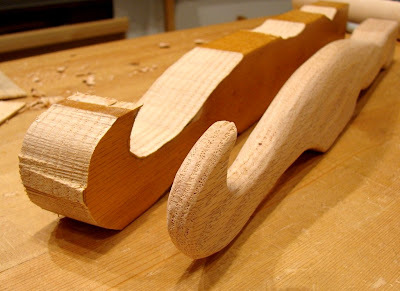 While using the spokeshave, I went ahead and reworked the curve in the bottom of the stretcher to more closely match the curves of the arms. After that, I used a brace and bit to bore both holes. That was all I accomplished during the week. Today I moved on to mounting the blade in the rods. After filing a flat to stop the bit from sliding off the bolt, I used my small hand drill to make the holes for the pins that would hold the blade. I experimented a little here, and heated the first bolt to red hot and let it cool. I wanted to see if it made a noticeable difference. It didn't. Hmm. That's the opposite of what I experienced with the bolt heads. Maybe I'm mental. 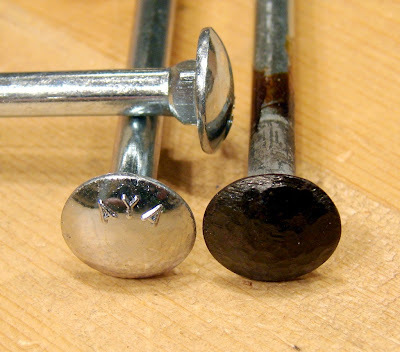 I don't suppose bolts have that much carbon in the steel - so no dramatic change makes sense. Now it was blade time. 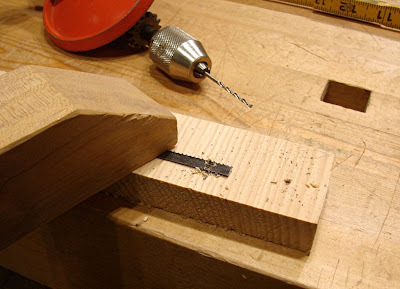 I assembled the saw and measured the distance between the pins (3p finish nails) in the rods. Then I subtracted 1/16 of an inch and I had my distance for the pin holes in the blade. 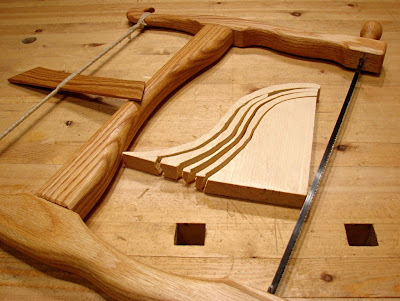 This would bring the bottoms of the arms together slightly, allowing for the blade to be stretched taught when the tension mechanism pulled the tops of the arms back together, and the bottoms apart. The 1/16th was just a guess. Turned out I should have made it more like 1/8th, but I'm getting ahead of myself. It worked great and had no trouble cutting the 1/4 inch blade. 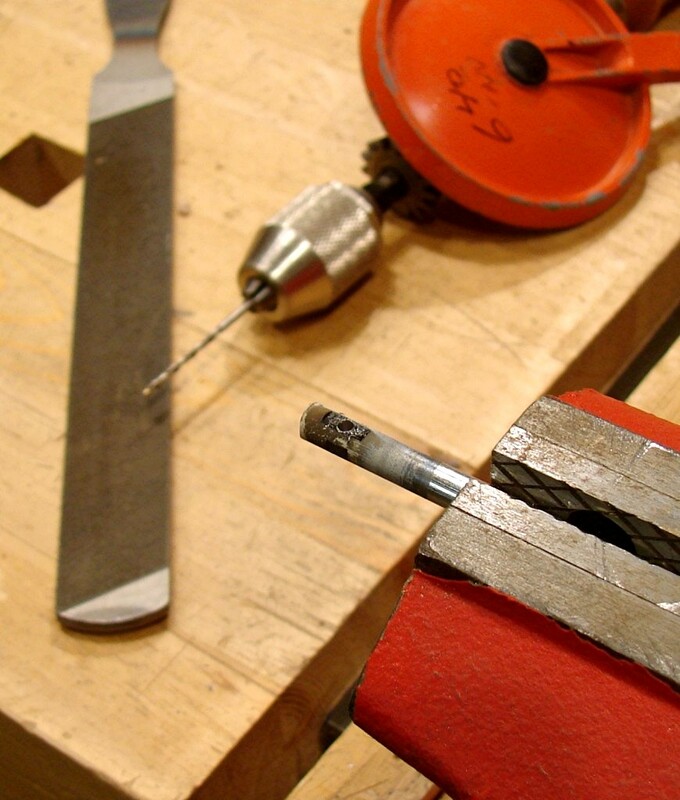 The vise allows for more control and the use of body weight to assist with the cut. To drill the pin holes in the blade, I just clamped the blade to a piece of scrap and had at it. It took some pressure to get started, but once it did, the bit had no problem. I did use my fist under my chin to help apply steady pressure on the handle of the hand drill. Once the blade was mounted in the rods I could make the simple tensioning system. I cut about 12 feet or so of twine and soaked it liberally with mineral oil. It's my pet theory that the oil allows the fibers and strands to slide over one another and "self adjust" so that they all share the load equally. I have no proof that this works, but I dramatically reduced my breakage rate once I started using this approach. To apply the twine, I wrapped it around one arm several times and then started looping it around both arms. When I ran out of twine, I wrapped the running end around the loops several times and then passed it through between them. 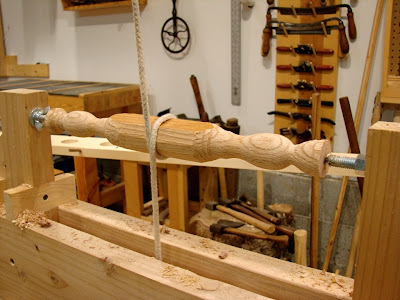 I inserted the toggle stick between the loops and started winding. As the twine twisted tight, the extra oil got squeezed out. I just rubbed it into the saw. To test the blade tension, I plucked it with a fingernail. Here's where I realized that I should have shorted the blade holes by 1/8 rather than 1/16 of an inch. 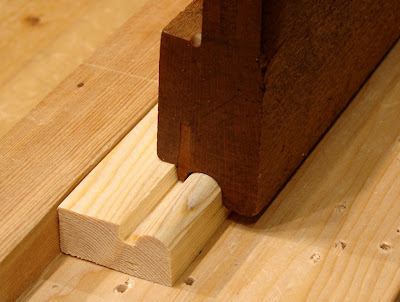 The tenons were fully seated and the blade was not fully tensioned. The real fix would have been to make a new blade, and I probably will - at some point. The temporary fix was to put a washer between each knob an the frame. I kept on applying tension until it started to sound musical; changing from a "thunk" to a "twang!" Time for some test cuts. Not very pretty, but that was my fault not the saw. I wasn't really watching what I was doing: I kept looking at the saw to see if it was flexing or moving. Nope - ship shape! It worked great. Oh yeah - when I took that last picture, I had forgotten to snip off the nails that are functioning as the pins to final size. Quick work with nippers - should have done it before the picture. Doh! Thanks to all who participated - particularly Clarke and Brian, this challenge's Ubergaloots! I salute you! Making A New Turning Saw - Part IV - Now With Bonus Fun Attached! 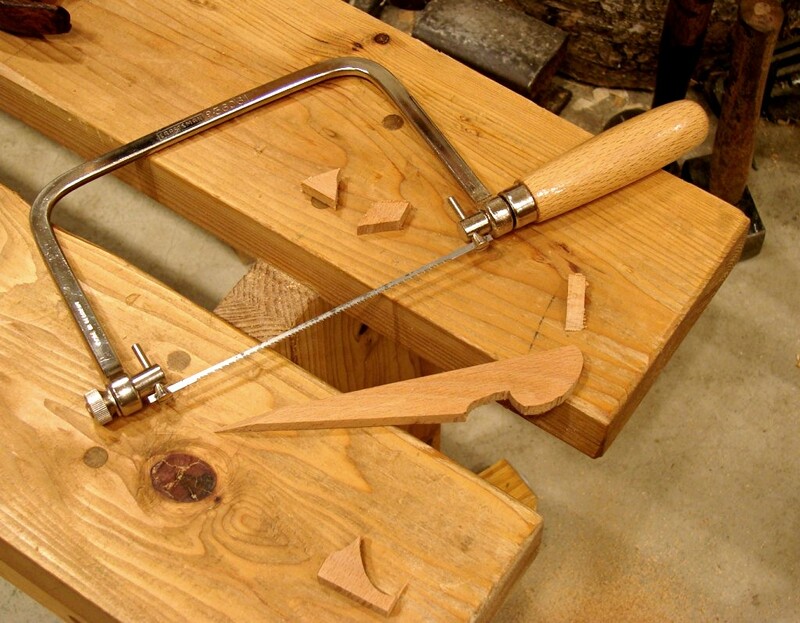 Well, the new turning saw is almost finished. There were only two things left to work on, the tensioning mechanism, and the blade (or web) assembly. Really pretty straight forward - which of course, in my shop, just cannot be tolerated! It was time to make things "better". Finally, I decided to just use a carriage bolt that passes all the way through the knob. 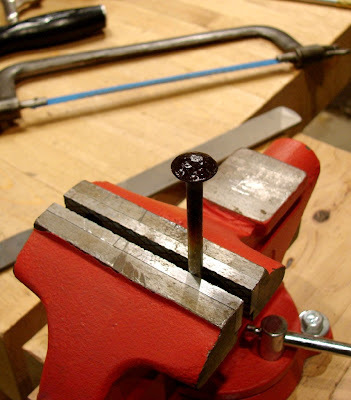 By squaring the hole with a chisel, the squared shank of the bolt (just under the head) will keep the rod from turning independently of the knob. I didn't however, like the look of the bolt head - especially the raised three letter part code. So, as frequently happens, one solution created another challenge. I ended up heating the bolt head red hot and peening it in the pritchel hole of my small anvil to create a "hammered" look. 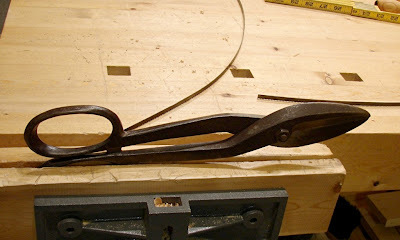 Then I tried something new, which I had only read about - darkening the steel with an oil patina. Here's what I did. 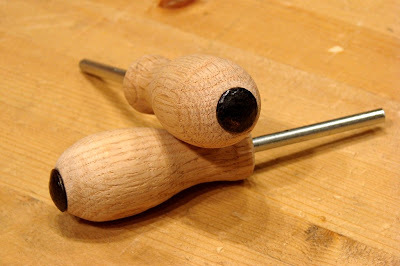 I put a thin coat of Tried and True Original Wood Finish (linseed oil and beeswax) on the bolt heads. 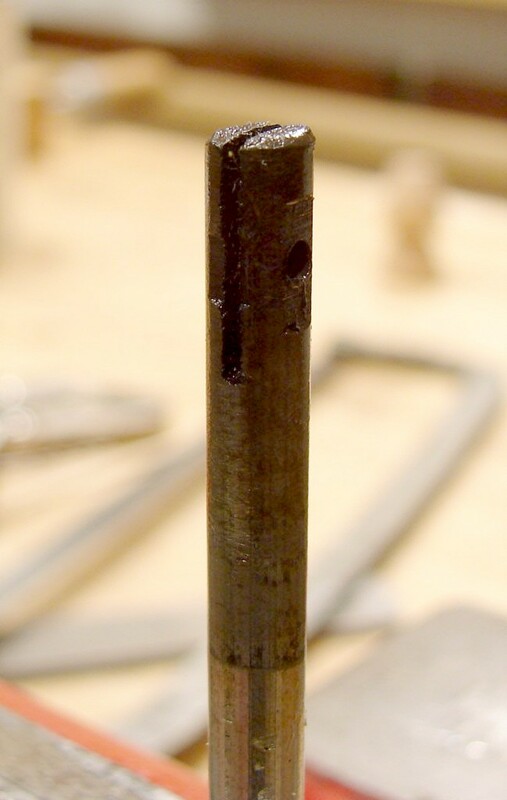 Then, holding the bolts in a machinist's vise, I heated the shank below the head with a torch until the oil began to smoke and darken. It took a little practice to get the heating just right. Too much heat (the first time, I heated the bolt head directly) and the oil burnt off completely - too little and it just looked bad and didn't harden. In the end, I had bolt heads that were black, with dark amber highlights. Cool! I really like it when a project takes me into new territory - especially when it works out well. 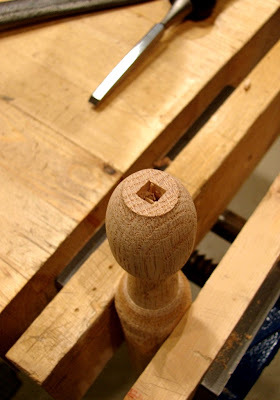 At this point I should have been almost done, but after looking at my curvy, rounded saw parts, and the straight, faceted design of my knobs I knew it was time to break out the spring pole lathe and make some rounded knobs. 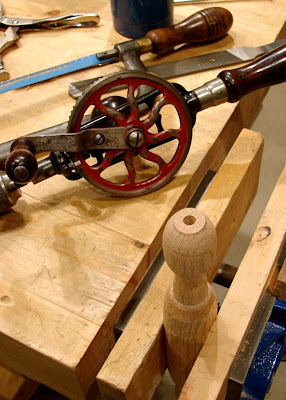 Several years ago I started building a fly-wheel treadle lathe ala St. Roy. It was slow going and mid-build, eager to see if I even enjoyed turning, I converted it to a spring pole set-up. I rigged up a shock-cord spring on the ceiling and built an overly complex (hmm...) treadle. 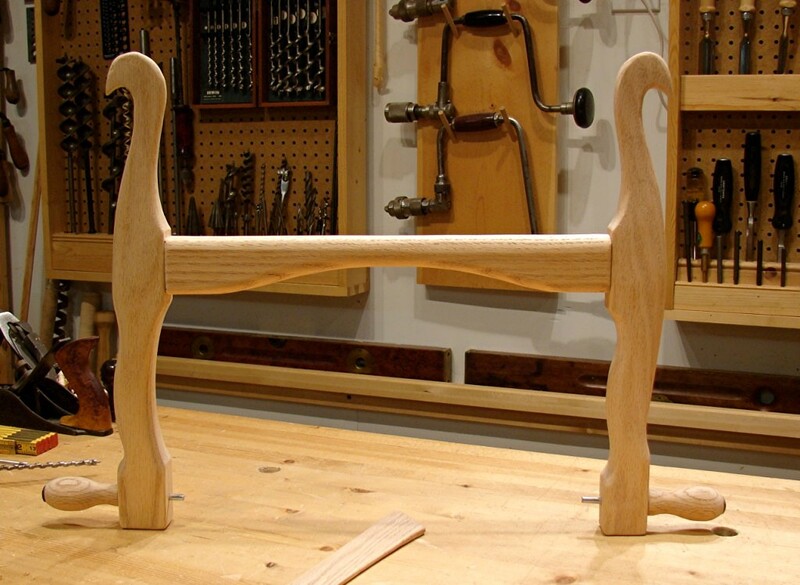 It worked well enough for me to make the shaker pegs for the peg board coat rack that now lives under the medicine cabinet; and I haven't finished the fly-wheel part - yet. Now all that is left to do is cut the slots and pin holes in the rod ends to hold the blade, cut the blade to length, and mount it. 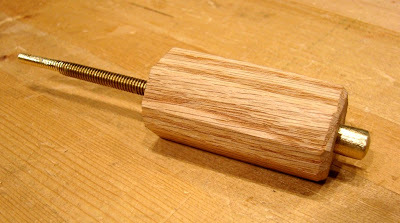 Then wrap the cord and use the toggle stick to create tension. That's it! Continued and CONCLUDED (I swear!) in Part V.
While you are waiting for Part V, here's a random tool shot and a bit of fun. 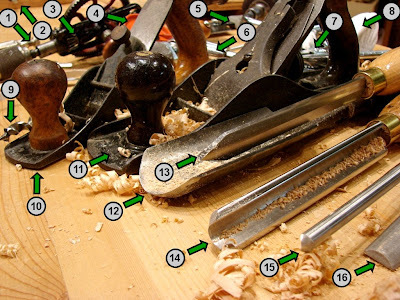 Can you name the 16 hand tools visible in this photo? Ubergaloot status granted to the first commenter with the correct list! Or the closest list; this might be harder than I think. Click on the image for a larger view and give it a shot! It was time to refine the shape of the new saw; making it lighter both visually and physically. 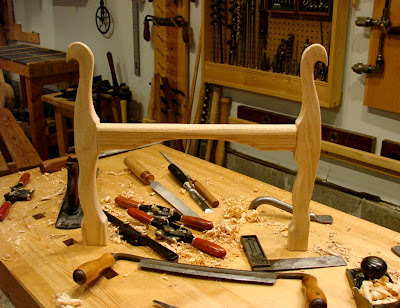 Most of the work was done on the shavehorse, but some work was done over at the bench vise. The tools used were: drawknife, spokeshaves, files, and a knife. The work was slow but fun. I just shaped it by eye. The hardest part was not taking off too much - it's addicting!